Release cues can be different things to different people. I’m not aware of any official definition or description, but I do know what they mean to me and to Eloise. I share my explanation and approach with clients, and we discuss whether it works for them or if it needs adjustment. An important part of the description for me is that it gives the dog choice. I describe it to clients as meaning “go be a dog”. In other words, do whatever you would like to do: sniff in the bushes, roll in the grass, pee, chase a butterfly, run around like a crazy thing or anything else you’d like. There are implied limits which have been developed separately. I work hard to remove all reinforcement from these behaviors and offer strong reinforcement for incompatible behaviors. Digging in the vegetable garden is an example. When I release Eloise, running over to dig in the garden is something I hope she chooses to avoid because we’ve worked hard on passing the garden without digging, and allowing digging as much as she wants in other places. One can also use management strategies to put limits on what the dog is released to do. If you have a fenced yard, and you release the dog into that yard, behaviors are constrained by the physical limitations of the fence. That’s ok. Hopefully the yard is big enough for fun and contains opportunities for enriching activities such as rolling in the grass. I want the release to allow the dog to find something enjoyable. That’s where the choice comes in. If I release into a small, concrete kennel with nothing to do, that isn’t a lot of fun, and so the release word will not be reinforced. I train the release cue as the opposite of a wait cue. Using a door as a management aid, I open it only a crack and click/treat if the dog stays seated. We then progress, millimeter by millimeter, with the dog learning that if she just sits there as the door open and closes, she gets handed treats (be sure the dog has had opportunity to relieve herself beforehand so you aren’t fighting that urge to go out). Once the dog is secure in her waiting behavior, I open the door fully and this time I give the release cue and use my own enthusiastic body language to encourage the dog to go outside with me. At that point I walk off, allowing the dog to do what she likes. 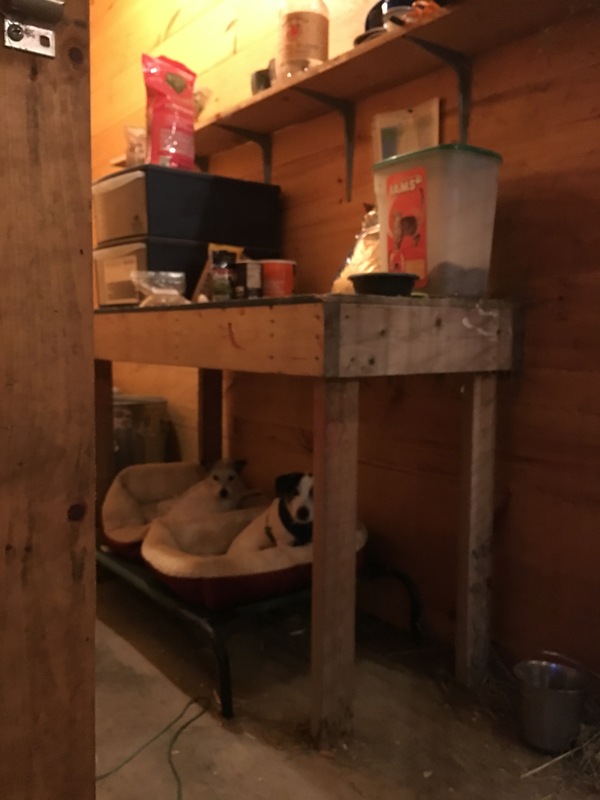 For my dogs, doors opening becomes a cue to wait until released and that includes barn doors, car doors, garage doors, etc. I consider it a necessary safety feature for a dog to always wait for permission before blasting through a door into an unknown environment (such as cars or other dogs). This also includes going IN. This becomes valuable in what we Vermonters call mud season, when the walking surface of our world becomes liquid and that liquid gets transferred onto dog paws. Nothing ruins a day like opening your car door to get something and having your dog enthusiastically leap in leaving paw prints and belly smears all over the seat of your car. Here is a video of Eloise waiting to be released into the car. Here is Eloise waiting to be released from the car. At times I have found myself caught off guard when Eloise chooses to do something other than what I expected. Probably 350 days of the year, when I say “break!” (her release word) and I open a door, she responds by going through the door. But there are days, especially this time of year when an open door lets a frigid blast of air in, that Eloise chooses to do something other than go through that door. At the very least she backs up a step and looks at me as if to say, “thank you but I think I’ll wait a while”. I have to remind myself that her release cue means she can do what she wants! Knowing that she has a bladder of steel and we have a dog door into a safe kennel for her to use when she decides she really has to go, I have to respect her decision not to go out with me. More recently, Eloise’s choice showed how strong environmental indicators are. She has learned that the last thing I do before I leave the barn in the morning is close the stall doors on the south side of the barn. Because one of my horses is very adept at opening the exterior stall doors, I close the interior stall doors for added security. That has become her indicator that I am finally ready to leave the barn and either go for a walk or go in the house for breakfast. If the barn kennel door is open, I find her dancing behind me as I close the doors. She is ready! If the kennel door is closed, I find her dancing behind it, waiting for her release cue when I open the door. I go in and out of the kennel a lot during chores because it also houses feed and tools. She stays in on her warm bed until she hears those doors close. I have been introducing Wilder puppy to the release cue. He is more curious and is out in the barn a lot if I leave the door open. That is fine because if the dogs need to be safe, I close the door. Door open means they are free to come and go. The other day I was practicing with him and when I said “break!”, Eloise did not budge off her bed. She knew chores were not over and given the choice, she was going to stay right on that warm bed! But once the stall doors had been closed, then she chose to leave the kennel. Even when it meant being swarmed by the little monster. Always a good reminder that the animals tell us what cues mean. If it’s not what we think, then we have to adjust our training or our expectations.